There are several types of crafts and crochet is one of those types that is very popular and that enchants to virtually all people, difficult who does not think handsome. It's a cheap job to do, just with a hook and yarn you want. With these materials we can produce wonderful pieces that are used in our daily life such as tablecloths, rugs, bedspreads, blankets, clothes and accessories in general. For some people it is recommended to practice crochet even in a therapeutic way so as to relieve stress and avoid depression. There are many patterns that exist and more various ways to modify and produce the crochet as you prefer. 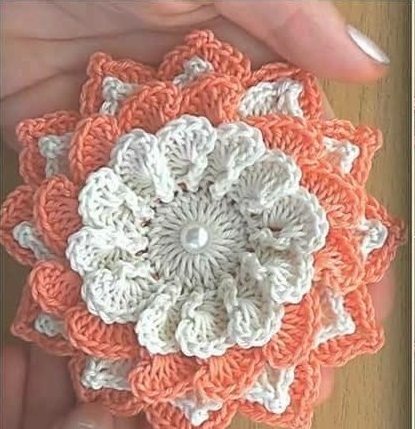 Crochet flowers are one of the most practiced and made pieces because they can be used in many things in different ways, they are very versatile, as well as being very charming and economical. It is one of the patterns that is most sought and made, especially at the beginning for those who are learning to crochet because it is easy to do. Good thing is that we can make the same pattern of the flower several times changing the color and making combination, use the imagination! You who are passionate about crochet or who are embarking on the crochet world now, stay tuned to our patterns that we always leave beautiful jobs available that can help improve your skills and yours as well as increase knowledge. 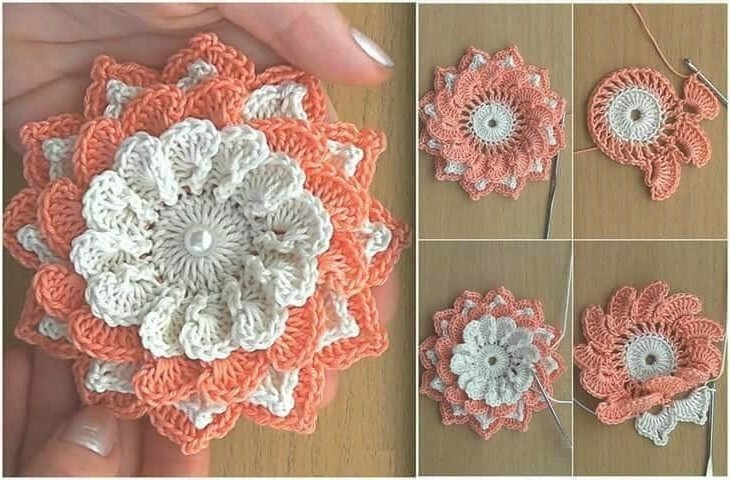 This pattern I bring today of Crochet 3D flower is super easy to learn and to do. Let's put your hand in the dough and let your creativity flow and so create beautiful works for yourself or give as a gift to help the end of the month bills. A crochet flower is very beautiful and it improves any work already done by changing the environment in which it stays. I was looking for some pattern of crochet flower and found it very beautiful in 3D, made with layers giving a special touch and that can make in various colors to decorate your home, leaving the environment comfortable. In addition to using this flower to decorate rugs, we can use to make hair ornaments that is only sew a staple in the crochet flower that will look lovely. Another very cool option is to use the dinner table as a detail in the sousplat or the napkin holder, leaving your dining table more cozy, charming and beautiful, you can do according to your decoration for example: the color of the towel or other table decorations, Gorgeous in the same color. At last the crochet flowers have a thousand uses. It gives a special touch to the decor of your table and a combination with the color combination to make the atmosphere more cheerful and charming. The texture of the crochet leaves a different and beautiful effect on the decor, I'm sure your dinner guests will feel special and super welcome. If you liked do not waste time, do it right now. Below I leave the video tutorial with everything you need with step by step how to make this 3D flower pattern and start to prepare your home decor. Do beautiful work and please everyone. Enjoy our Xell Crafts facebook page and see you next time.